Our beautiful Corten Steel round firetables, are stunning! The round shape allows you to enjoy the warmth and atmosphere that this garden fire has to offer from all sides. Starting out as blue steel, once corten steel is exposed to the elements it will naturally weather over time and develop a protective layer of rust, giving its unique browny orange colour. We also offer our firetable with the option of a built in grill to help kick start that outdoor cooking! The rusting process can take a varied amount of time depending on the weather conditions, but this process can be sped up by simply spraying water & salt mixture onto your fire table to reach your desired rustic affect. 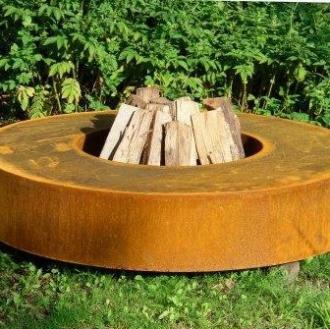 Once it has reached your disired rust look we recommend using our Owatrol varnish to stop your firepit rusting any further, simply CLICK HERE to add to your order.